The 2017-18 season is almost here. I’m talking about basketball. Duh. We’ve known most of the opponents for a while now, and now it’s all about the when and where. Let’s get into it by month. I’ve never heard of Barry University, but that game doesn’t count anyway. The Tigers start off with Norfolk State which should be around a 104-54 victory. Then Bruce Pearl takes his team to the Charleston Classic for a nice little weekend trip. Most of the possible opponents there could be tests, but all are winnable. Then there’s Winthrop the day after the Thanksgiving, and the day before the Iron Bowl so the overnight tailgaters will have something to do. The next week Auburn travels to Dayton, which they may have played 10 days before, or something… That seems weird since Auburn is calling that a non-bracketed game from the Charleston Classic. We’ll see. The 2006 Cinderella/Final Four George Mason Patriots come to Auburn Arena to start off December, but they haven’t been that good in the last decade. Wow, that was 10 years ago. Time, man. Gardner-Webb will be a blowout and then UAB comes back. Remember, the “best basketball program in the State” is 0-2 against Bruce Pearl’s basketball Tigers. In sort of a return neutral-site game, Auburn will travel to Birmingham to face Middle Tennessee State. You’ll remember that Auburn lost to the Blue Raiders in overtime in a neutral-site Nashville game in 2015. Going to Murray State is pretty cool. They are a nice little mid-major. And in easily the biggest non-conference name traveling to Auburn, big ol’ UConn comes to little ol’ Auburn to try exact revenge from last year’s loss. To finish the year, and finish the out-of-conference slate, Andy Bernard’s Cornell will come lose badly in front of a sparse, student-less crowd. To start the SEC slate, Bruce Pearl goes back to Tennessee. Are we still talking about that? I hope not. Arkansas in Auburn is good. They usually get hot late, and it’s best to get them outside of Bud Walton. Like football season, basketball will play Ole Miss and Mississippi State back-to-back. There’s no reason to lose either of those. For the first time since the previous eclipse, Auburn will travel to Alabama on a weeknight. So finally the “too old to drive from Birmingham that late” crowd will see what it feels like. Big win. Then there’s a back-and-forth from UGA, to Missouri, LSU, to Ole Miss. I don’t think any of those teams are decidedly better than Auburn. The best thing about February is that Auburn doesn’t have to go to that gimmick of an arena in Nashville. Auburn still hasn’t beaten Vandy in 800 years, so maybe this is the year. Texas A&M and at Georgia will be tough because those two situations usually are. AND THEN I take @BeautifulBlogle out on a Valentine’s Night date to watch Auburn take on Kentucky. We’ll kiss as Auburn goes up 20. A trip to South Carolina will be one of the toughest games on the schedule. I don’t know how or why, but I guess they are good now. Then the ODK Foy Sportsmanship Trophy comes back to Auburn before a very tough ending of the shortest month on the calendar. At Florida and at Arkansas. Yikes. Ending the regular season with a win over a good South Carolina team will likely bump the Tigers up a seed in the SEC Tournament. 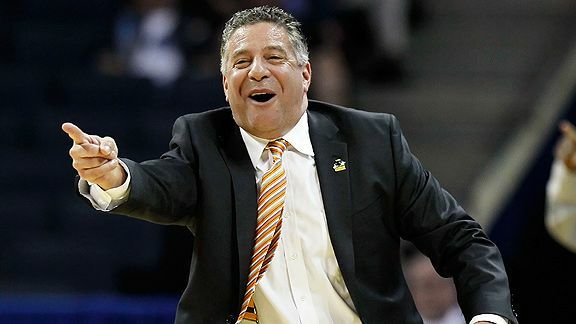 After making it to the weekend for the first time in a good while, Bruce Pearl is finally dancing again. You have to think this is the year, right? Leave your comments below.